A Legend. A living, breathing, Legend. He had carved his bloody name in history with nought but an axe. Deathwalker the Nadir called him. But that was a long time ago. Druss feels a legend in his own rights, or at least as old as one. The only silver he sees in his retirement is the grey in his hair, not the treasures of youthful victory in battle. Death waits for Druss, he knows this, and Death is patient. It taunts him with senility as his health fades. The Nadir horde march for Drenai. Dros Delnoch, a garrison of ten thousand, stands before half a million bloodthirsty tribesmen. If the garrison falls, the Nadir will swam through the pass it guards and slaughter a nation. Druss is summoner by the dying Earl of Delnoch. Death has summoned him to battle. Axe in hand, Death at his shoulder, Druss answers the call to war. He knows this is his end, but he lived a Legend and Legend's turn the tide. The Nadir will know the Legend one last time. Deathwalker comes. 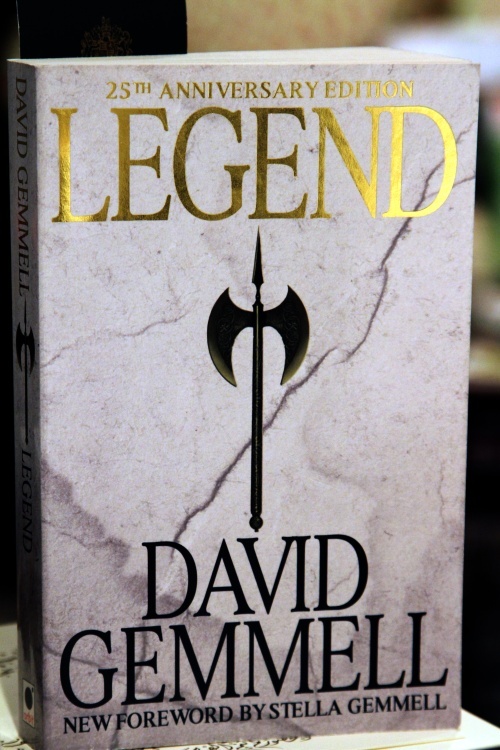 It's no mystery that I'm an avid fan of David Gemmell. He is my idol. The man is big-daddy-of-heroic-fantasy if you ask me. Legend was the first novel that I truly read. I could not read until I was eleven. No, that's wrong. I did not want to read. Gemmell changed that for me, and he started with Legend. Sure, the book is an 'adult' story, and I was little more than a spotty pre-teen. There's violence, there's love...there's passion. I laughed and I cried. I read about men who stood against death and life itself. I wanted to be one of those men. Gemmell writes 'lightly'. Don't take this the wrong way. He doesn't skim on detail nor does he info-dump pages of history on you in a oner. His voice is light as it's easy to read, so easy in fact that eleven-year-old-me who didn't-want-to-read-EVER finished Legend in a single night. My mum wasn't impressed with the bags under my eyes, but she was gob smacked by the fact that I had actually read a book, let alone in a few hours. I cared for the characters. I laughed when they laughed, cried when they cried, and cursed when things went awry for them. They are all human. Not just human in the typical fantasy trope (there's no elves or dwarves here, back to Middle Earth for you high fantasy lovers!) but human in their emotion. Gemmell fully realises his characters so much so that they are real. Sure, the basic plot is pretty norm. Small army versus bigger army, oh noes! But it's the characters, their lives and the subtle plot twists that make this book...well, a classic. It's these differences that turn Legend from an everyday fantasy novel, into a heroic-fantasy-legend. Legend has something for everyone. It was Gemmell's first novel, my first read, my first choice of book to review, and it will be the first choice if anyone asks me to recommend them a book.